It is February 1813. The defeated remnants of the once invincible Grande Armée have arrived back in the West. Despite the catastrophe in Russia, all is not lost for Napoleon. 1813: Napoleon’s Nemesis” is strategic in scope. Combat units represent all the divisions (categorised as veterans, line or conscripts) which took part to the campaign, together with the most important commanders. 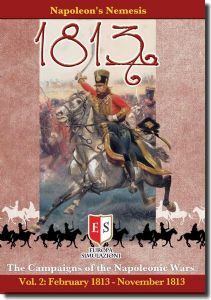 The game presents strategic options corresponding to those available to Napoleon and the Coalition forces, and replicates the consequences which flow from each. At the same time, it captures the essence of campaign warfare during this period – sweeping manoeuvres, feints and deceptions, forced marches, and the greater flexibility and cohesion of seasoned troops – as well as the crucial matter of logistics. The Basic Rules are simple and can be learnt very quickly minimising the amount of time players need to spend consulting the Rulebook. Optional Rules and Advanced Rules (including cards) add even more realism and sense of period. Invasion of Russia (1812). 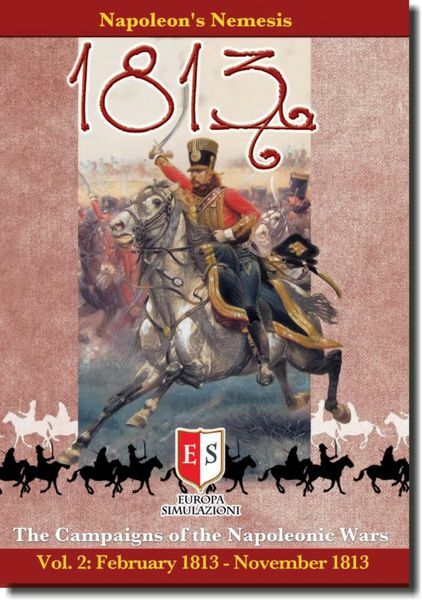 First entry in a new series of games covering the Campaigns of the Napoleonic Wars at low to moderate level of complexity.